According to our tradition and historical annals, Buddhism was introduced into during the lifetime of the Buddhua Himself. On the request of the people and the king, the Buddha visited Rakhaing with His five hundred disciples and rested on the top of Salargiri Hill (ေသလာဂီရိ), situated on the right bank of Gisapanadi(Gacehabhanady) (ကစၦပနဒီ) River. 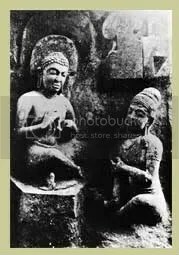 Before supervising the casting of His Image, Mahamratmuni, the Buddha prophesied relating to the country. The arrival of the Buddha in Rakhaing was during the reign of King Sadasuriya (စႏၵသူရိယ) who ascended the throne in the sixth century B.C. An ancient palm-leaf manuscript called Sababadhanapakarana (သဗၺဒါနပကာရန) gives detailed account of the casting of the Buddha’s Image, Mahmratmuni. During an inspired moment, Buddha remarked that the county would, in ages to come, be renowned for its production of grains and for that reason it would be known to all the worlds as Dhanyawadi. Since then the country has retained that name. The prophecy of the Buddha has amply been fulfilled by the abundance of paddy grain which years proved not country but also for exporting to neighboring countries across the sea. Thus, prosperity has prevailed in Rakhing through the generations. In addition to the ancient name Dhanyawaddy the country came name to be known as Rakkhapura, Rakhaing-Pray, the present day Rakhaing State. The explanation for this are offered in the following passage. All Rakhaing (Rakhaingness) designate themselves as Rakhaing.The origin of the term ‘Rakhaing’ is very ancient. The Rakhaing chronicle mentions the settlement of savage people called ‘Bee-loo’ (may be Negrito) which stands for the Pali Rakkhar or Raksasas. Probably, the term originates from Sanskrit Raksa meaning Bee-loo. native people usually called themselves ‘Rakhaing’. It is believed among those people that the term ‘Rakhaing’ denotes those who safe-guard the two essential qualities, namely, the nation and morality (Sila). In early time, the Buddhist missionaries used to called the country Rakkhapura(ရကၡပူရ),the land of the Rakhaings. On the other hand, the Rakhaing or Arakan people are popularly known as ‘Magh’. Scholars hold different views about the etymology of the term ‘Magh’. Scholars think that, it is a Persian word denoting “fire-worshipper”. This is un-likely. At the present all Rakhaings are Buddhists and no worshippers have ever been known among them. According to some other scholars, the word ‘Magh’ is delivered to derive from ‘Magdu’, a Sanskrit word for a sea-bird. Therefore, it can be said that the term of ‘Magh’ denotes sea-traveler, or seafarer. Sir Arthor Phayre pointed out that the name ‘Maga’ originated from the ruling race of Magadha in India. There had been culture inter-relations between Magadha and Rakhaing in ancient times. It is therefore claimed that Rakhaing were descendants of Magadha. However, the term ‘Arakan’ is generally used by foreigners instead of Rakhaing. In interesting paper by Colonel Yule on the oldest record of the sea- route to China from Western Asia, the author identified the country, named ‘Argyre’ in Ptolemy, as Arakan. Ptolemy who sailed along the Rakhaing coast in the second century A.D. mentioned a number of ports in Argyre (silver country) which might be Rakhaing. Because, his list begins with the port of Barakaura, which as well as see later can be identified as situated at the mouth of Naaf River the border between Bengal and Rakhaing. The name Arakan is supposed to be derived from the silver mines existing there at that time. This name may be a corruption of the native name Rakhaing, from which the modern European form, Arakan, is derived. On the other hand, Gerini is convinced that that the name Rakhaing, Rakhaing is derived from Plaksa, Balaksa, Palaksa, meaning ‘white’ or ‘sliver’ from the fact that sliver was found in the country, and that name ‘Arakan’ is nothing but a Portuguese and Arab corruption of the original ‘Rakhaing’. In this connection it is interesting to note that Shahabufin Talish, a Mohamedan historian of the 16th century, mentioned that there were several mines of sliver in Arakan. Later on, the Dutch traders of 17th century stated that, among the other things, Arakan exported sliver. It is also interesting to note that the Tamil word for demon, bee-loo, derived from Sanskrit raksasa, is ‘arakan’. There appears to be some connection here with Tamil ‘arakan,’ ‘shelac’, which is said to be derived from the lexical Sanskrit raksa (ရကၡ) “lac”. It seems that Arakan, in the first centuries of the Christian era, was a major source of lac. Lac had been produced by its oldest hill tribes in Rakhaning Roma. On the northern face of the Shitthaung(သွ်စ္ေသာင္း) pillar, engraved in the mid-11th century, it was mentioned for the first time the word Arekadesa (အာရက ေဒ့ရွ္), meaning ‘the land of Arakan’. It was probably the name for Rakhaing at that time. The term ‘Rakhuin’ was found in the Pagan (Bagan) inscription which was dated 1299 A.D.
Nicola Conti (1420-1430 A.D) wrote ‘Rachani’ as the name of the country. Sidi Ali Chelebi, a Turkish navigator belonging to the middle of the sixteenth century wrote as ‘Rakanj’. All these forms are forms are closely related to the original term. The term Aracan was first used by Borbosa as quoted in Ramusio in 1516 A.D. The usage was taken up by the later Portuguese and other European travelers and chroniclers, and the term was variously described as Recon, Rakan, Arracam, Aracao, Orrakan, or Arakan which nearest to modern name Arakan. The term ‘Arakan’ is generally used by foreigners. However, the native people usually called themselves ‘Rakhaing’. It is believed among these people that the term ‘Rakhaing’ denotes those who safeguard the two essential qualities, namely, the nationality-heritage and morality-Sila (အမ်ဳိး). At one time, when the upper Kaladan River was flooded by heavy rains, a prince who came from Kapilavastu (ကပ္ပီလဝတ္) and his wife, a daughter of local tribal chief, had been swept away in the river. They swam to save their lives and finally landed on the bank near Selargiri Hill (ေသလာဂီရိ). The river was therefore named Kulartant (Kular=swim), (tant=stop). Later on it changed to Kular-tant, Kulardan, and Kalardan etc. The ancient name of Kaladan River is Gacchapanadi. The term originates from Pail word, meaning ‘Tortoise-shell River’. Because there are many stones which look like tortoise-shell in upper river. I posted this ARTICLE from the book of the name of ” A Guide to Mrauk-U, An Ancient Capital of Rakhine, Myanmar” by Tun Shwe Khaing (M.A) (First Edition 1992) Page 17 -19 . I change some word such as ” Rakhine changed into Rakhaing , Gacehabhanady into Gacchapanadi, Salagiri into Selagiri, Dhanyawaddy into Dhanyawadi .